Tel Vos is the home of the youngest of the Telvanni Mage Lords, Master Aryon. The tower is located in the north-central Grazelands, and Master Aryon is the only Councilman whose Tel is not on an island. Perhaps as a sign of his relative youth and openness to new ways, Master Aryon's tower is quite unique. 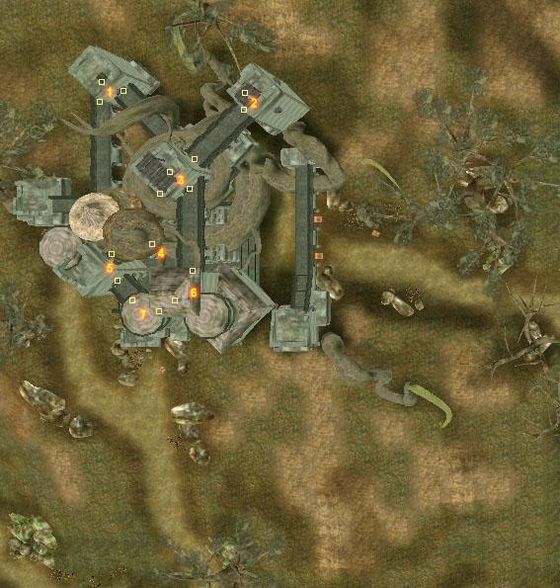 Tel Vos appears to originally have been an Imperial fort, with the Telvanni taking ownership (recently and forcibly, judging by the presence of Imperial prisoners) and growing their iconic mushroom structures around it later. Aryon himself resides at the top, accessible only with levitation. As a living fungal form, the tower actually interpenetrates the stonework, and Aryon's experiment cannot be seen as a complete success. While Tel Vos is worth a visit out of pure architectural interest, it also has a Dwemer museum, a small but excellent library, and a dungeon. Tel Vos is the primary regional center for the Grazelands, extending Telvanni influence beyond traditional reaches. The lack of services in Vos make what's available in Tel Vos all the more important. Services available in Tel Vos include an enchanter and trader in enchanted goods, an apothecary, and Milar Maryon who sells spells and potions. All can be found in the Services Tower. A dirt road leads east to Vos. Tel Mora is very close from there, to the east across the water. The Falvillo's Endeavor at the docks in Vos can take you to Sadrith Mora, Tel Aruhn and Tel Mora. The ship also makes a nice home in this area. A path south leads through the Grazelands to the Ashlander settlement of Zainab Camp. A path west leads to the foothills of the Ashlands and some Dwemer ruins. Rotheran has the closest Propylon Chamber, located to the north in the direction of Dagon Fel. Tel Vos makes a good starting point for hunting the free-roaming Daedra in the Grazelands. To reach the chambers of Master Aryon, you'll need some form of Levitate, though with a high Acrobatics skill it is possible to jump from the tops of some of the towers instead. Behind Aryon, on top of the ledge, behind the middle tendril lies a hidden Grand Soul Gem. In Tel Vos, check the Northeastern Tower. Look for a Hidden Door on the first landing from the bottom of the staircase. This will lead to a trapdoor which in turn leads to a small room with Azura's Servant (an enchanted Daedric Shield), a Steel Spear of Impaling Thrust and a Last Rites axe guarded by a Dremora. A trapped Hidden Door is also located in the Central Tower, at the bottom of the staircase that leads to the Imperial Museum. Behind the door you will find two crates; one contains a random steel weapon while the other holds a standard potion of night-eye, a quality potion of light, and an exclusive rising force potion. On top of one of these crates is a cloth sack containing 100 gold and situated on top of the other is a cruel flameblade. Situated next to the crates is a barrel containing an assortment of loot, including up to 30 random marksman weapons, up to one random enchanted item, up to six other random items, and up to five gold. Finally, beside the barrel is a locked and trapped chest containing one apprentice's lockpick and probe along with one journeyman's lockpick and probe. In the jail and its dungeon, you will find five pages of Beram's journal, in which he describes his crew of laborer's attempt to clear the jail cells of the roots made by the Telvanni mushroom tower, before he and his companions fall victim to a Daedra in the dungeon ruins. There is also some valuable Limeware and Dwemer Clutter and ten Dwemer Coins in the dungeon. The town of Vos is just down the hill. The Dwemer ruins of Nchuleft are southwest, at the foothill of the mountains. The Ahemmusa Camp is north of Tel Vos. The Zainab Camp is south of here. Cure Blight: Deliver three Cure Blight potions to an alchemist in Tel Vos. Daedra Skin: Find and deliver a Daedra skin to Master Aryon in Tel Vos. Mudan-Mul Egg Mine: Cure the blighted Kwama queen in this egg mine west of Tel Vos. Wizard Spells: Learn three spells at the request of Aryon. Odirniran: Help Milyn Faram, who is being attacked by House Hlaalu. Mages Guild Monopoly: Convince three Redoran Councilors to support a proposal to allow House Telvanni to compete with the Mages Guild. Shishi: Rescue Faves Andas from House Redoran forces northwest of Maar Gan. Recruit a Mouth: Recruit a mouth in order to be promoted to Councilor. Kill Raynasa Rethan: Kill this Hlaalu noble in Rethan Manor south of Balmora. Kill Banden Indarys: Kill a Redoran noble in his manor house. Archmagister Gothren: Get the support of all House Councilors to become the Archmagister. 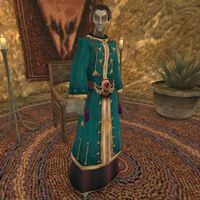 Kill the Telvanni Councilors: A strange request from the Arch-Mage to kill all the Telvanni councilors. Vampires of Vvardenfell, Vol II: Find a rare vampire book, Vampires of Vvardenfell, Volume II. Murder Rimintil: Kill a troublesome Altmer for Mouth Raven Omayn in Sadrith Mora. Trade Mission to the Zainab: Help Turedus Talanian in Tel Vos learn some information about the Zainab Ashlanders. This page was last modified on 4 January 2019, at 15:54.